Hope you’ve always wanted a smartphone-controlled door lock because the tech world is here to shove them in your face. Or hand, rather. Several companies, with more on their way, are competing to be the clever barrier between you and the inside of your home. What all of the locks have in common: you control and manage them with a smartphone and/or web app. Some require that you replace the entire lock system, while others let you place a smart device over an existing deadbolt. You might need to tap a lock with your finger to let yourself in, or maybe all you have to do is just walk up and wait for it to recognize you and unlock. 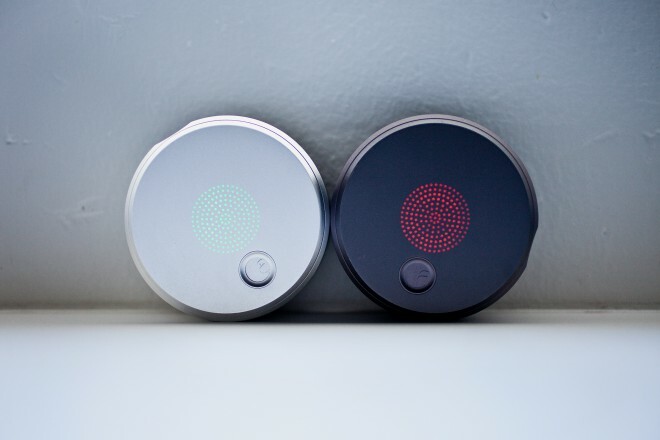 Each smart lock has its own little quirks and perks. They’re all pretty awesome re-imaginings of a millennia-old technology. Here’s a breakdown of the features, pros and cons of what’s out there to help you get ready to pick your first smart lock. The $200 August smart lock is arguably the most elegant of them all, thanks to Yves Behar’s design touch. The brushed aluminum circular lock replaces your old deadbolt, and you’ll be able to control and manage it from an iOS, Android, or web app. August notifies you when certain people come in and out of your house, and lets you give out unlimited digital keys to your friends and family, customizing for exactly how long they’ll have access, what days, or even between what hours. The lock only uses Bluetooth low energy to recognize when a phone with a digital key is near. No need to bring the phone out; August unlocks automatically. The $179 Lockitron is a simple smart lock that fits directly over the deadbolt on the back of your door. Plus, it will work with any smartphone using a mobile web app that lets you lock and unlock your door with a tap. You can also grant access to friends, family and guests through the app. The lock itself has built-in WiFi, so it can send you notifications no matter where you are. You get keyless entry if you own an iPhone 4S or iPhone 5 since the lock will recognize when you walk up via Bluetooth 4.0. It’s not the prettiest smart lock available, with its plasticky looking body, but it looks by far the easiest to set up. Schlage’s $200-$300 locks are more on the old-school end of the smart lock spectrum. Instead of coming from a hot new tech startup, it’s made by an established lock manufacturer. A keypad on the door lock grants you access with a four-digit code. But you can still manage the lock through a smartphone, tablet or web app using Nexia Home Intelligence. It lets you create up to 19 private codes for various friends and family members, allowing you to customize codes so that they only work in a given time period. You can then delete and create new codes whenever needed. Plus, you can lock and unlock your door from anywhere. The biggest drawback: You’ll have to pay a monthly subscription fee of $9 to be able to remotely control the lock. Goji is the latest smart lock to join the bunch, launching its Indiegogo campaign earlier this month. It’s also the most ambitious. Much like August, the $278 Goji features a circular disc that goes over your current lock. But instead of going on the inside of your door, the disk is located on the outside and you will need to replace your entire locking system with Goji. It also features an LED screen that displays a greeting to the person who is entering or leaving the home. The fanciest feature: The lock includes a built-in camera that takes a photo of the people who activate the lock. You can start collecting photos of people at their most unflattering angle. Beyond that, Goji promises all of the same keyless automatic entry and customizability available in the August lock. Unfortunately, it doesn’t really exist beyond a crowdfunding campaign. As seen on Shark Tank! The Kevo lock’s claim to fame is that it got a bunch of funding from a reality TV show. But the lock itself is pretty impressive, too. Now fully blessed by lock megacorp Kwikset, the lock does require a full install. An app links your iPhone (sorry – no Android) to the lock using Bluetooth, eliminating the need to fumble through your pockets or purse for your keys. Just tap the lock with your finger and the halo flashes green, letting you know the door is unlocked. You can send digital keys to other people and manage those keys from the app.